In October of 2016, it never occurred to us at NCCF that we would still, in July, be granting, discussing and working with community partners on how to best serve victims of Hurricane Matthew. Imagine what the victims must feel. See Eight months later here. News cycles are usually short, so Hurricane Matthew’s continuing aftermath is not still being widely covered by media, despite its historic proportions and long-term devastation. But a quick recap of some of the metrics* shows why disaster recovery remains central to many eastern North Carolina communities, grantmakers like NCCF, economic development organizations and emerging long-term recovery groups, to name just some of the involved entities. Individuals, business owners and farmers are still dealing with the challenges. An NC Department of Commerce report estimated that the state has nearly $1.8 billion in unmet needs in the areas of housing, infrastructure and economic development. And that doesn’t count the $93 million needed to make up for farm losses not covered by the US Department of Agriculture. While emergency funding from the federal government totaled more than $500 million directly after the disaster (not including Federal Emergency Management Agency allocations) dire needs remain. The federal government’s recent response to the State of North Carolina’s latest application for emergency assistance totaled less than one percent of the requested $929 million. The US government answered with $6.1 million in aid, or a 0.7 percent allocation of the request. As of press time, this assistance amount was being appealed. That colossal shortfall places continued reliance on local and state governments, as well as nonprofits and funders. All are feeling the pinch of reduced budgets and lingering economic slowdowns, with some even citing leftover woes from 1999’s Hurricane Floyd. NCCF is still at work ensuring responsible grant allocations from the Disaster Relief Fund. The Foundation has raised nearly $800,000 for the fund to date. Most of our nearly 700 gifts have been small donations, indicating the power of giving at any level to help face a disaster, said NCCF CEO Jennifer Tolle Whiteside. “Many contributions were accompanied by heartfelt notes from people of all ages, all walks of life and from all over the world,” she said. Penny drives and bake sales spearheaded by children to city-wide efforts masterminded by motivated millennials and major corporate contributions helped NCCF raise a record amount in a relatively short period. Tolle Whiteside especially wanted to acknowledge generous corporate and foundation support, including the Tides Foundation, upon recommendation of the Google Foundation; AT&T; First National Bank of Pennsylvania, which recently completed a merger with Yadkin Bank; the Humana Foundation; the Oak Foundation; the Duke Energy Foundation, which spearheaded a 90-day matching gifts campaign for NCCF; the Carolinas Credit Union Foundation; the Winston-Salem Federal Credit Union and several individual small businesses and family foundations that requested anonymity. NCCF’s board of directors recently approved the statewide grants committee’s recommendation that the Foundation allocate another round of disaster relief grantmaking. The latest allocation totals about $207,500 and will go to 15 NCCF affiliates serving the parts of eastern North Carolina that are still recovering. Of those, severely hit Edgecombe and Robeson counties will receive allocations of $35,000 each, and Wayne and Lenoir counties will receive allocations of $25,000 each. An initial wave of grants from NCCF’s Disaster Relief Fund at the beginning of the year totaled $286,000, which went to 20 NCCF affiliates in affected areas. NCCF also allocated a grant to the Cumberland County Community Foundation to help with extreme needs there and sponsored an NC Rural Center program designed to help affected communities leverage grant dollars. NCCF Grants Director Leslie Ann Jackson said that the focus of our support continues to rest squarely on our affiliates in eastern North Carolina, particularly in the counties mentioned above. “These are allocations that we are confident will be granted in a meaningful way, because our affiliate boards live and work in these communities and know firsthand where these resources can make the most impact,” she said. Monies left in the NCCF Disaster Relief Fund also may be allocated to regional entities focusing on recovery, Jackson said. Emerging long-term recovery groups (LTRGs) are being formed or reactivated in the hardest hit counties, where particular benefit could result from collaboration and leveraging shared resources. She noted that NCCF planned to bring representatives of some of these groups together to encourage the sharing of best practices and lessons learned. Director of Community Leadership Sally Migliore noted that several of NCCF’s affiliate board members are involved in local recovery endeavors and LTRGs, which again shows the value of local leadership. “We’re not surprised that many of those leading this important recovery work are also involved with our affiliate foundations,” she said, and pointed to Ken Windley as an example. Windley is a long-standing member of the Robeson County Community Foundation’s affiliate board. The retired county manager has served as both the interim director and chair of the Robeson County Disaster Recovery Committee, which has emerged as the local LTRG that will assist the Lumberton area with recovery. Now that immediate relief needs have largely been met, a new set of longer-term assistance is emerging in Robeson County, according to Windley. “The needs that are surfacing now center around home repairs that are not dependent on volunteer groups, like the Baptist Men, for example; furniture and appliances; and mold remediation,” he said. Jackson said that list mirrors needs we’re hearing about in other parts of eastern North Carolina affected by Matthew and added mental health assistance. “Mental health issues are not uncommon among those still struggling with disaster recovery,” she said. 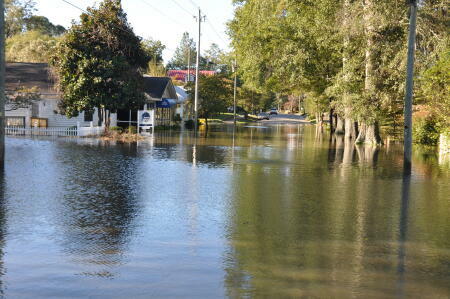 This was corroborated by Regional Director Kelly Lee, who as NCCF’s liaison in the Coastal Plain North, serves several of the counties that are still struggling with recovery, including Edgecombe and Wayne. “There are so many families displaced, who haven’t even gotten back into their homes yet,” she said. Lee noted that it’s not uncommon to see piles and piles of debris outside of gutted, red-tagged homes, which is the FEMA sign for unsalvageable residences. She described a drive through Princeville like a visit to a ghost town, with the activities of a community caught by calamity frozen in time. And she is aware that many within the Latino population are too scared to even seek government assistance for which they qualify, relying solely on local churches for assistance. “It’ll tear your heart out,” Lee said.